Marriage*: He married Lulu Dice. Note*: They lived near Mace, Indiana, then at Crawfordsville, Indiana. Marriage*: She married Odis A. Stafford, son of William A. Stafford and Virginia A. Loop. [S988] Pauline Randel Walters, comp., Deaths in Southeastern Part of Montgomery County, Indiana with a Few from All Over the County (n.p. : n.pub. 1971), p. 231 (giving her name as Ollie). [S988] Pauline Randel Walters, comp., Deaths in Southeastern Part of Montgomery County, Indiana with a Few from All Over the County (n.p. : n.pub. 1971), p. 231. [S988] Pauline Randel Walters, comp., Deaths in Southeastern Part of Montgomery County, Indiana, above, p. 231 (giving her name as Ollie and naming Daniel Remley as her father). [S988] Pauline Randel Walters, comp., Deaths in Southeastern Part of Montgomery County, Indiana, above, p. 231 (giving her name as Ollie). Other Names*: Lydia L. Loop, Lydia Loop, Lydia Ellen Loop Bratton, Lydia Loop Bratton, Lydia Ellen Bratton, Lydia L. Bratton, Lydia Bratton. [S987] Frances Haynes Quinn, comp., Obituary Dates and Your Family Ties: Over 140 Years in Montgomery County, Indiana (Cottage Grove, Ore.: Cottage Grove Gen. Soc'y 1987), p. 18 (naming Andrew Loop as her father). [S987] Frances Haynes Quinn, comp., Obituary Dates and Your Family Ties: Over 140 Years in Montgomery County, Indiana, above, p. 18. [S987] Frances Haynes Quinn, comp., Obituary Dates and Your Family Ties: Over 140 Years in Montgomery County, Indiana, above, p. 18 (naming Lydia Loop as his mother). [S987] Frances Haynes Quinn, comp., Obituary Dates and Your Family Ties: Over 140 Years in Montgomery County, Indiana (Cottage Grove, Ore.: Cottage Grove Gen. Soc'y 1987), p. 18 (naming Charles Bratton as his father). [S987] Frances Haynes Quinn, comp., Obituary Dates and Your Family Ties: Over 140 Years in Montgomery County, Indiana, above, p. 18 (naming Catherine Dice as his mother). [S987] Frances Haynes Quinn, comp., Obituary Dates and Your Family Ties: Over 140 Years in Montgomery County, Indiana, above, p. 18 (giving the place but not the date). [S961] Find A Grave, online at http://www.findagrave.com, memorial for Dr. Roscoe L. Bratton, memorial no. 43926745, viewed on 7 Feb 2019 (giving the date but not the place). [S1561] Indiana Marriages, 1811-2007, online at https://www.familysearch.org, record for Maurice Fletcher Bratton and Lottie Gertrude Carlisle, viewed on 7 Feb 2019, citing Putnam County marriage records, vol. 23, p. 80 (not giving the date or city but stating that he was born in Montgomery County, Inciana). [S987] Frances Haynes Quinn, comp., Obituary Dates and Your Family Ties: Over 140 Years in Montgomery County, Indiana, above, p. 18 (not giving the date or place). [S961] Find A Grave, online, above, memorial for Dr. Roscoe L. Bratton, memorial no. 43926745, viewed on 7 Feb 2019 (not giving the date or place). [S961] Find A Grave, online, above, memorial for Ruth Fletcher Bratton, memorial no. 33842275, viewed on 7 Feb 2019 (not giving the date or place). [S1561] Indiana Marriages, 1811-2007, online at https://www.familysearch.org, (not legibly stating the bride's name). [S961] Find A Grave, online, above, memorial for Dr. Roscoe L. Bratton, memorial no. 43926745, viewed on 7 Feb 2019. [S987] Frances Haynes Quinn, comp., Obituary Dates and Your Family Ties: Over 140 Years in Montgomery County, Indiana, above, p. 18 (naming Roscoe L. Bratton as his father). [S961] Find A Grave, online, above, memorial for Dr. Roscoe L. Bratton, memorial no. 43967092, viewed on 7 Feb 2019 (naming Dr. Roscoe L. Bratton as his father). [S961] Find A Grave, online, above, memorial for Maurice F. Bratton, memorial no. 43967092, viewed on 7 Feb 2019 (naming Dr. Roscoe L. Bratton as his father). [S1561] Indiana Marriages, 1811-2007, online at https://www.familysearch.org, record for Maurice Fletcher Bratton and Lottie Gertrude Carlisle, viewed on 7 Feb 2019, citing Putnam County marriage records, vol. 23, p. 80 (naming Roscoe Bratton as his father). Other Names*: Ruth Fletcher Bratton, Ruth Bratton. Obituary*: "Rantoul, Ill., January 27, 1913 - Mrs. R. L. Bratton, wife of a well-known Rantoul physician died at 2 o'clock Sunday afternoon, after an illness of eight months. The decedent was about 28 years old and leaves her husband and one child, aged 2 years. • Her Find A Grave memorial, which includes a brief obituary and a picture of her gravestone, is here. [S961] Find A Grave, online at http://www.findagrave.com, memorial for Ruth Fletcher Bratton, memorial no. 33842275, viewed on 7 Feb 2019. [S987] Frances Haynes Quinn, comp., Obituary Dates and Your Family Ties: Over 140 Years in Montgomery County, Indiana (Cottage Grove, Ore.: Cottage Grove Gen. Soc'y 1987), p. 18 (not giving the date or place). [S987] Frances Haynes Quinn, comp., Obituary Dates and Your Family Ties: Over 140 Years in Montgomery County, Indiana, above, p. 18 (naming Ruth Fletcher as his mother). [S961] Find A Grave, online, above, memorial for Ruth Fletcher Bratton, memorial no. 33842275, viewed on 7 Feb 2019 (naming Ruth Fletcher Bratton as his mother). [S961] Find A Grave, online, above, memorial for Maurice F. Bratton, memorial no. 43967092, viewed on 7 Feb 2019 (naming Ruth Fletcher Bratton as his mother). [S1561] Indiana Marriages, 1811-2007, online at https://www.familysearch.org, record for Maurice Fletcher Bratton and Lottie Gertrude Carlisle, viewed on 7 Feb 2019, citing Putnam County marriage records, vol. 23, p. 80 (naming Ruth Fletcher as his mother). [S987] Frances Haynes Quinn, comp., Obituary Dates and Your Family Ties: Over 140 Years in Montgomery County, Indiana (Cottage Grove, Ore.: Cottage Grove Gen. Soc'y 1987), p. 18 (naming Roscoe L. Bratton as his father). [S961] Find A Grave, online at http://www.findagrave.com, memorial for Dr. Roscoe L. Bratton, memorial no. 43967092, viewed on 7 Feb 2019 (naming Dr. Roscoe L. Bratton as his father). [S961] Find A Grave, online, above, memorial for Maurice F. Bratton, memorial no. 43967092, viewed on 7 Feb 2019 (giving the date but not the place). [S1561] Indiana Marriages, 1811-2007, online at https://www.familysearch.org, record for Maurice Fletcher Bratton and Lottie Gertrude Carlisle, viewed on 7 Feb 2019, citing Putnam County marriage records, vol. 23, p. 80. [S961] Find A Grave, online, above, memorial for Maurice F. Bratton, memorial no. 43967092, viewed on 7 Feb 2019. [S961] Find A Grave, online, above, memorial for Cecil Fruits Bratton, memorial no. 43967130, viewed on 7 Feb 2019. 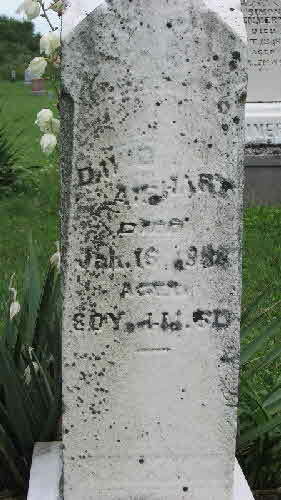 David Airhart's tombstone, Mount Zion Cemetery, Boone County, Indiana, by Marc Doty. Note*: In 1860 he and his wife were living in Boone County, Indiana. [S49] Jeanette Larsen, 1002 S. Circle Dr., Baytown, Tex. 77520, letter to Roger Bartlett, 1 Jul 1974, (birth and marriage dates; stating that they had seven children but not identifying them). [S984] Marilyn S. Walker, comp., Boone County, Indiana Deaths, 1921-1930 (n.p..: n. pub., 1996), p. 3, citing book R24, p. 25 (death record for John Airhart) (naming the place but not giving the date). [S349] Mabel Shanklin, comp., Montgomery County, Indiana Will and Marriage Records, vol. 1 (Danville, Ill.: Heritage House, 1969), p. 8 (citing Montgomery County Marriage Record Book 1, p. 121). [S986] Walter R. Gooldy, comp., Montgomery County, Indiana Marriages 1823-1849 (Indianapolis, Ind. : Heritage House 1985), p. 9 (spelling his surname as Airheart). [S961] Find A Grave, online at http://www.findagrave.com, memorial for Nancy Bowman Airhart, memorial no. 55073622, viewed on 5 Jul 2011. [S961] Find A Grave, online, above, memorial for David Airhart, memorial no. 28363189, viewed on 5 Jul 2011. [S984] Marilyn S. Walker, comp., Boone County, Indiana Deaths, 1921-1930 (n.p..: n. pub., 1996), p. 3, citing book R24, p. 25, and book H11, p. 56 (naming David Airhart as his father). [S961] Find A Grave, online, above, memorial for Nancy Airhart, memorial no. 57866083, viewed on 5 Jul 2011 (naming David Airhart as her father). [S984] Marilyn S. Walker, comp., Boone County, Indiana Deaths, 1921-1930 (n.p..: n. pub., 1996), p. 3, citing book R24, p. 25 (death record for John Airhart) (giving the place but no other information). [S984] Marilyn S. Walker, comp., Boone County, Indiana Deaths, 1921-1930 (n.p..: n. pub., 1996), p. 3, citing book R24, p. 25 (naming "Miss Bowman" as his mother) and book H11, p. 56 (naming "Mrs. Bowman" as his mother). [S961] Find A Grave, online, above, memorial for Nancy Airhart, memorial no. 57866083, viewed on 5 Jul 2011 (naming Nancy Bowman Airhart as her mother). "John Airhart, aged 84 years, 6 months and 27 days, died Monday evening at 7:10 o’clock at the home of his son, John A. Airhart, of Lower Mt. Zion from a complication of diseases. He had been ill eight days. "Mr. Airhart was married in June , 1862, to Mary Ann Emmert, who died April 31, 1915. Six children were born to this union, three of whom are deceased. The living are: Charles F., of Advance; John A., at Lower Mt. Zion and Mrs. Laura Emmert. One brother, Joseph Airhart, of Crawfordsville, and one sister, Mrs. Margaret Emmert, of near Jamestown, also survive. There are nine grandchildren and two great grandchildren. "At an early age, Mr. Arihart [sic] was united with the Lutheran church near New Ross. He has lived in Jackson township practically all of his life. [S961] Find A Grave, online at http://www.findagrave.com, memorial for John Airhart, memorial no. 57859276, viewed on 5 Jul 2011. [S984] Marilyn S. Walker, comp., Boone County, Indiana Deaths, 1921-1930 (n.p..: n. pub., 1996), p. 3, citing book R24, p. 25. [S1327] The Lebanon Pioneer, Lebanon, Ind., online at http://www.myheritage.com, 10 Feb 1921, p. 4, col. 3 (obituary of John Airhart). [S984] Marilyn S. Walker, comp., Boone County, Indiana Deaths, 1921-1930 (n.p..: n. pub., 1996), p. 3, citing book H11, p. 56. [S987] Frances Haynes Quinn, comp., Obituary Dates and Your Family Ties: Over 140 Years in Montgomery County, Indiana (Cottage Grove, Ore.: Cottage Grove Gen. Soc'y 1987), p. 2 (giving the date but not the place). [S1327] The Lebanon Pioneer, above, 10 Feb 1921, p. 4, col. 3. [S987] Frances Haynes Quinn, comp., Obituary Dates and Your Family Ties: Over 140 Years in Montgomery County, Indiana, above, p. 2 (naming John Airhart as her father). [S987] Frances Haynes Quinn, comp., Obituary Dates and Your Family Ties: Over 140 Years in Montgomery County, Indiana, above, p. 2 (naming John Airhart as his father). [S987] Frances Haynes Quinn, comp., Obituary Dates and Your Family Ties: Over 140 Years in Montgomery County, Indiana (Cottage Grove, Ore.: Cottage Grove Gen. Soc'y 1987), p. 55 (spelling his name as Stephen). [S987] Frances Haynes Quinn, comp., Obituary Dates and Your Family Ties: Over 140 Years in Montgomery County, Indiana (Cottage Grove, Ore.: Cottage Grove Gen. Soc'y 1987), p. 55 (spelling his name as Stephen and naming Simon Emmert as his father). [S987] Frances Haynes Quinn, comp., Obituary Dates and Your Family Ties: Over 140 Years in Montgomery County, Indiana, above, p. 55 (spelling his name as Stephen and naming Mary Canada as his mother). [S987] Frances Haynes Quinn, comp., Obituary Dates and Your Family Ties: Over 140 Years in Montgomery County, Indiana, above, p. 55 (spelling his name as Stephen). Birth*: She was born on 25 March 1840 in Indiana. Marriage*: She married _____ Minton. Death*: She died on 28 January 1874 at age 33. Note*: Her death date may have been 20 Jan 1874. Marriage*: He married Sarah Airhart, daughter of David Airhart and Nancy Bowman. 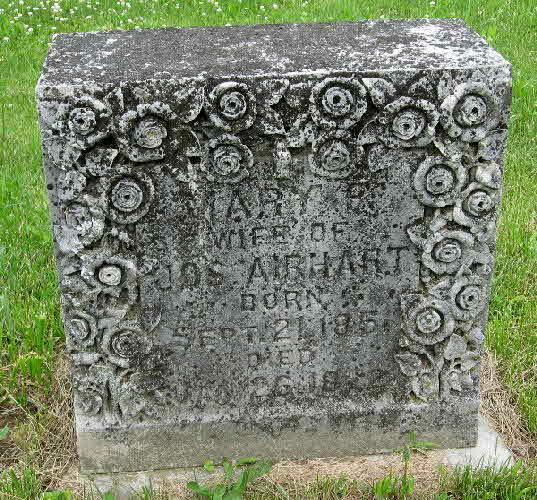 Joseph Airhart's tombstone, Mount Zion Cemetery, Jamestown, Ind., by Marc Doty. 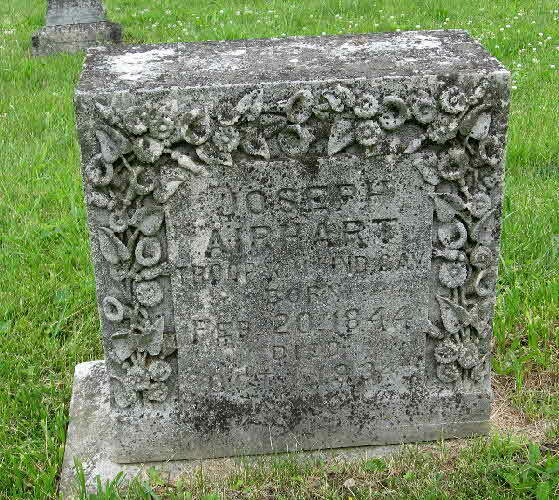 [S961] Find A Grave, online at http://www.findagrave.com, memorial for Joseph Airhart, memorial no. 28494818, viewed on 5 Jul 2011. [S961] Find A Grave, online, above, memorial for Mary Bush Airhart, memorial no. 28494906, viewed on 5 Jul 2011. [S987] Frances Haynes Quinn, comp., Obituary Dates and Your Family Ties: Over 140 Years in Montgomery County, Indiana (Cottage Grove, Ore.: Cottage Grove Gen. Soc'y 1987), p. 3. [S961] Find A Grave, online, above, memorial for Mary Jane Airhart, memorial no. 28841633, viewed on 5 Jul 2011 (stating that they were married but not giving the date). [S961] Find A Grave, online, above, memorial for Joseph Airhart, memorial no. 28494818, viewed on 5 Jul 2011 (stating that they were married but not giving the date). [S961] Find A Grave, online, above, memorial for Joseph Airhart, memorial no. 28494818, viewed on 5 Jul 2011 (giving the date but not the place). [S1326] The Hammond Times, Hammond, Ind., online at http://www.myheritage.com, 3 Oct 1934, p. 14, col. 5 (stating that "Injuries suffered when struck by an automobile caused the death of Joseph Airhart, 90, a Civil war veteran, at Crawfordsville [Indiana])." Mary Bush Airhart's tombstone, Mount Zion Cemetery, Jamestown, Ind., by Marc Doty. [S961] Find A Grave, online at http://www.findagrave.com, memorial for Mary Bush Airhart, memorial no. 28494906, viewed on 5 Jul 2011. [S961] Find A Grave, online, above, memorial for Joseph Airhart, memorial no. 28494818, viewed on 5 Jul 2011. [S961] Find A Grave, online at http://www.findagrave.com, memorial for Nancy Airhart, memorial no. 57866083, viewed on 5 Jul 2011 (naming David Airhart as her father). [S961] Find A Grave, online, above, memorial for Nancy Airhart, memorial no. 57866083, viewed on 5 Jul 2011. Birth*: She was born on 13 August 1809. Marriage*: She married Solomon Cawada on 6 April 1858. [S49] Jeanette Larsen, 1002 S. Circle Dr., Baytown, Tex. 77520, letter to Roger Bartlett, 1 Jul 1974, (birth and marriage dates). Birth*: She was born on 14 February 1811. Marriage*: She married Joseph Bowman on 8 January 1835 in Boone County, Indiana. Marriage*: She married Missouri Lucas on 17 November 1868. [S49] Jeanette Larsen, 1002 S. Circle Dr., Baytown, Tex. 77520, letter to Roger Bartlett, 1 Jul 1974, (giving her name as Sarah; Lucas marriage). Marriage*: He married Sarah ('Sally') Airhart, daughter of Peter Airhart and Elizabeth Fulwider, on 8 January 1835 in Boone County, Indiana. Catharine Airhart Bowman's tombstone, Providence Cemetery, Beckville, Ind., by Manson Linn. [S49] Jeanette Larsen, 1002 S. Circle Dr., Baytown, Tex. 77520, letter to Roger Bartlett, 1 Jul 1974, (giving 23 Dec 1812 as her birth date, giving 22 Mar 1864 as her death date, and stating she was unmarried). [S961] Find A Grave, online at http://www.findagrave.com, memorial for Catharine Airhart Bowman, memorial no. 55018245, viewed on 5 Jul 2011. 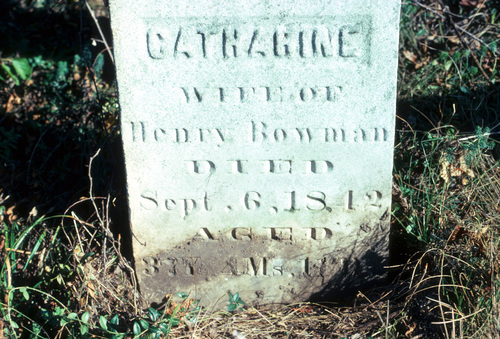 [S961] Find A Grave, online, above, memorial for Henry Bowman, memorial no. 55017210, viewed on 5 Jul 2011. [S961] Find A Grave, online, above, memorial for Mary M. Bowman Airhart, memorial no. 55316589, viewed on 5 Jul 2011 (naming Catharine Bowman Airhart as her mother). Henry Bowman's tombstone, Providence Cemetery, Beckville, Ind., from findagrave.com, by Manson Linn. Note*: They moved to Jefferson Township, Boone County, Indiana in 1832. One source give 19 May 1863 as his death date, and another says he died on 19 Mar 1869. 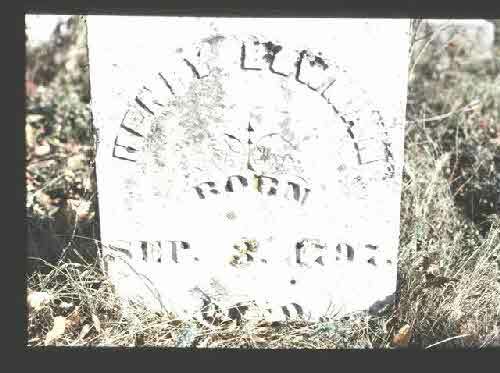 [S961] Find A Grave, online at http://www.findagrave.com, memorial for Henry Bowman, memorial no. 55017210, viewed on 5 Jul 2011. [S961] Find A Grave, online, above, memorial for Catharine Airhart Bowman, memorial no. 55018245, viewed on 5 Jul 2011. [S961] Find A Grave, online, above, memorial for Nancy Bowman Beck, memorial no. 49875722, viewed on 5 Jul 2011 (naming Henry Beck as her father). Birth*: She was born on 20 October 1822. Marriage*: She married Sebastian Stipes. Death*: She died on 5 October 1890 at age 67. Note*: She may have been born on 20 Sep 1822. Marriage*: She married Jacob Miller. Birth*: She was born on 7 March 1826. Birth*: He was born on 3 November 1827. Marriage*: He married Mary Ellen Lockeridge on 18 February 1851. Death*: He died in 1905. Note*: His first name may have been Oliver. Birth*: She was born in 1833. Marriage*: She married John C. Bowman, son of Henry Bowman and Catherine Airhart, on 18 February 1851. Death*: She died in 1904.